Leave your assumptions-and your excuses-at the door. 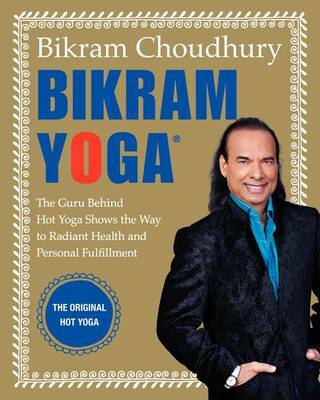 Bikram Choudhury, the world's foremost authority on Hot Yoga, is here to show you the true way to self-improvement and a new love of life. Based on a centuries-old and scientifically proven pathway to health, Bikram Yoga will whip your body, mind, and spirit into shape. Based on Bikram's signature program of 26 postures and two breathing exercises, this book will help you combat a variety of afflictions-from stress and insomnia to arthritis and back pain-and maintain exceptional health for years to come. The various postures work your muscles, increase flexibility, and flush toxins out of your system-a completely natural, full-body workout without the unhealthy stresses and dangers of a gym. It isn't easy: It's a rigorous, body-bending program, and Bikram gives it to you straight in his outspoken, charismatic, and tough-love fashion. But just like the hundreds of thousands of students who go to his studios across the country, you'll end up sweaty and exhausted but keep coming back for more. Additionally, Bikram Yoga can help you do much more than drop inches from your belly. Bikram explains how practicing yoga is also a mental and spiritual mission that can help you create a path to true happiness. When it comes to love and marriage, realizing your full potential, or living a life in perfect balance, Bikram's yogic philosophy shows you how physical strength and flexibility can be a gateway to mental clarity and spiritual calm. If you've never tried Bikram's yoga, get ready for the deepest, most beneficial class of your life. And if you're an old hand at it, your understanding of the postures and the sequence will increase exponentially, as will your results. So are you ready to achieve lasting health and happiness? The time has come for Bikram Yoga. Grab your mat and get ready to change your life.